The Moonen 84 was conceived and created as a classic displacement yacht with steel bottom and aluminium superstructure. The designer René van der Velden has created an elegant yacht with plenty of space both indoors and out. 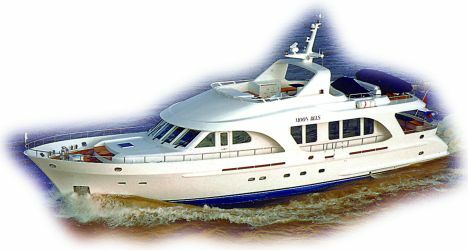 Inside there is a full width owner's cabin, three guest cabins and two crew's cabins, all with en-suite bathrooms. On the main deck the bridge is forward in a central position and also includes a small lounge, aft of which, to starboard, there is a dining room and to port a spacious galley. Astern in the spacious bridge house is the saloon, which takes up the entire width of the structure and includes a sofa, two armchairs with coffee table, portable bar and shelves with accessories such as stereo and TV. The fly is spacious and covers the cockpit completely. Aft on this deck there is a fair- sized tender plus a jet-ski which can be launched using a davit while in the central area there is a spacious living room with two facing sofas, small tables, portable bar and galley with sink. Forward is the outdoor control station. The cockpit, easily accessible from the stern swimming platform by steps lined in teak and two openings on the transom at different heights, includes a table with chairs and a sofa. Outside, the decks are fully lined in teak. For further information please contact: Moonen Shipyards bv; Graaf van Solmsweg 52; 5222 BP's- Hertogenbosch P.O. ; The Netherlands; tel. +31 (0) 73 6210094; fax +31 (0) 73 6219460; e mail info@moonen.com; web-site www.moonen.com. Water tank capacity: 3,800 lit.